If you have trading cards you don't need then the goal wall is place to go to. 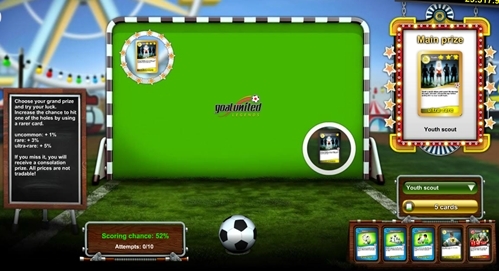 The goal wall is pretty straight forward, you select card that you want to try to win and then put in 5 cards for a shot on the wall. Simply drag 5 cards into the card slots on the bottom right and hit the "5 cards" button to shoot. Rarer the cards that you have placed in the slots, the better is scoring chance. In case that you miss you will then receive a consolation prize (card). Every day you can use the goal wall up to 10 times.